Water, water, everywhere/ Nor any drop to drink. Surrounded by a vast ocean, the sailors aboard the ship in Coleridge’s Rime of the Ancient Mariner are cursed to a most ironic end; starving for water, afloat on a windless sea. Though there exists a key difference between the saline beneath the ship and the fresh water the sailors so desperately need, the similarities are so much greater. While most of us will (hopefully) never find ourselves aimlessly adrift, destined to die waterless or become the subjects of a timeless poem, I think we are all familiar in some way with the ‘Water Everywhere’ effect. Surrounded by what may seem like a resource, what may seem like sustenance, we find that, in fact, we’re missing what it is we need. Growing up and moving on from school has led to one such situation. We’ve finally entered the great, wide world of opportunity, of ‘make your own way,’ and found…what? As for me, I’ve found that the land of opportunity means often being far from where I want to be, and even farther from knowing where I’m going. Make my own way? A person needs a destination to make a way, and it turns out that opportunity doesn’t mean any answers, just room for more questions. I’m moving again this November to upstate New York to do something for the Army (still in the dark about exactly what), debating how long to stay with the Army, whether to apply for grad school on the side, what I want to study; change is part of life, but life can be frighteningly large and claustrophobically limiting at the same time. 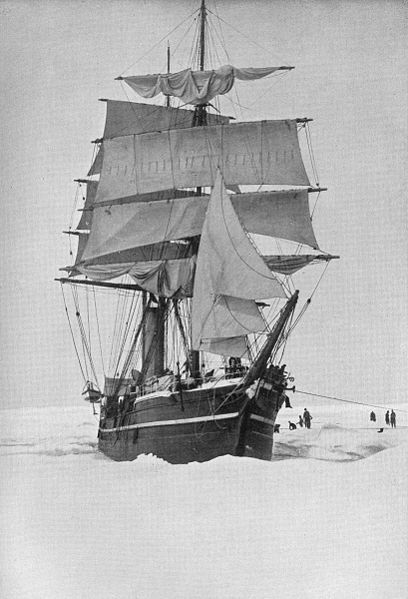 Captain Scott’s Terra Nova at the South Pole. The open sea is exciting, vast, and full of the beautiful and dangerous unseen. Growing up is the same way, large enough that anything could lie just over the horizon. That fact is amazing, but when you find that the water on which you float isn’t exactly like you thought it’d be, isn’t like the water you’ve grown to need and expect, it can be scary, too. Maybe the next step is figuring out how to use the water we’re given, the uncertainty, to make ourselves and others better. I certainly hope so – that sounds much more comforting than the uncertainty of drifting.